3-star Michelin Chef Daniel Bouloud re-interprets classic Parisian bistro with the sophistication of New York City to spawn the concept of db Bistro Moderne. 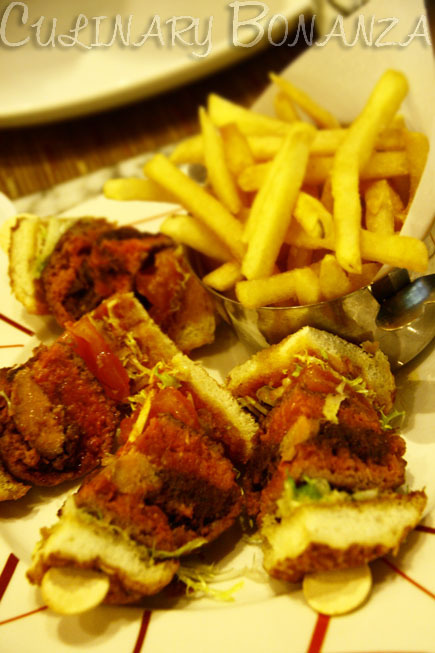 The fancy bistro offers traditional French delicacies, tastefully mixed with contemporary American nuances to create internationally appealing cuisine. 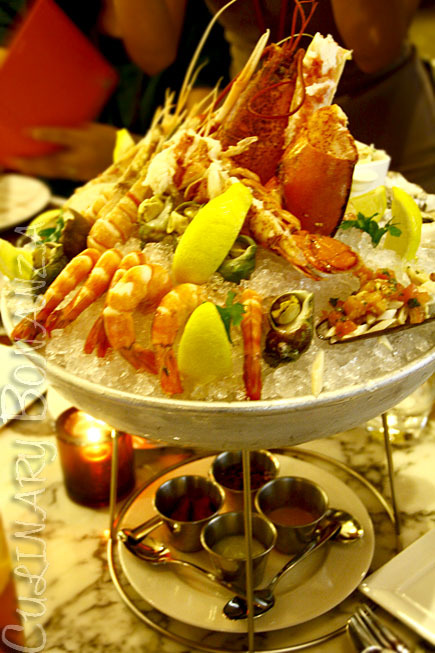 db Bistro Moderne at Marina Bay Sands is designed to cater to all sorts of occasion, from the casual cafe & bistro setting, to a slightly more serious restaurant area, with a stylish bar, and private rooms. 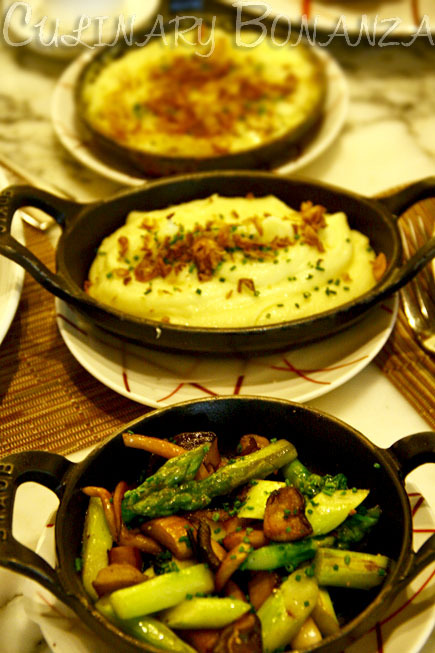 Before watching Slava's Snow Show at the Theater, we were scheduled to have dinner at db Bistro Moderne by Daniel Bouloud. 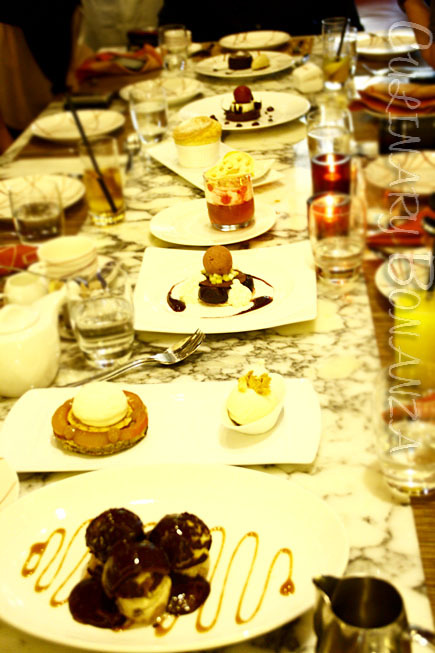 Chef Boulud himself was regrettably, not present at the time of our visit. I can only imagine having to manage 13 restaurants in 6 locations scattered across the globe, from the Big Ben to the Big Apple. 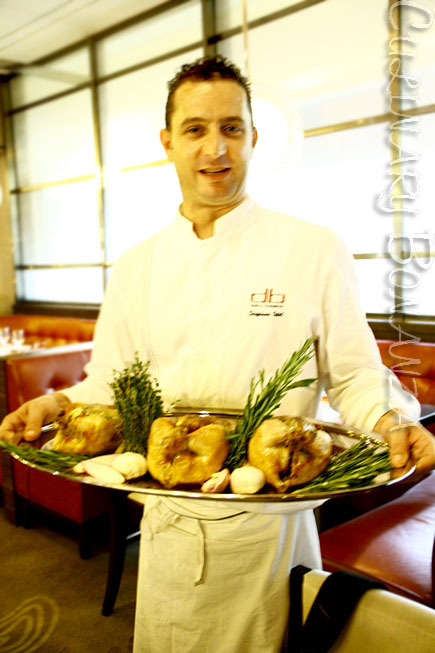 The Chef trusted the operations in Singapore in good hands: Executive Chef Stephane Istel, who has worked alongside Chef Boulud for more than 6 years. 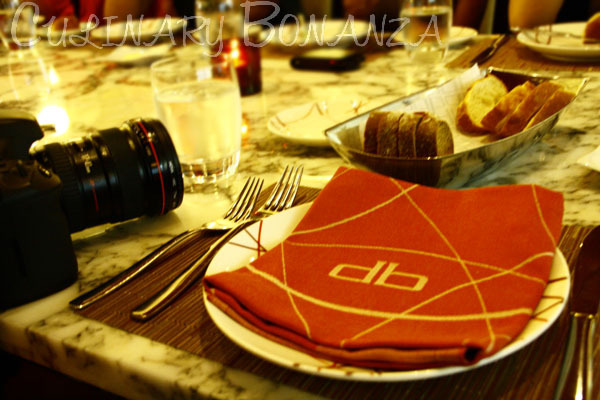 Delightful and generous doesn't even begin to describe our experience at db Bistro Moderne. Chef Istel and team personally prepared our dinner for that evening. He is such an affable chef with his acute tendency to say "superb!" that sounded really adorable with his French accent. I was actually surprised that the dinner menu doesn't have any chicken dish in it! I scanned and scanned again, but there's not a word 'chicken' or 'poulet' in it. If my eyes may have been wrong, surely "ctrl+F" can't be fooled? 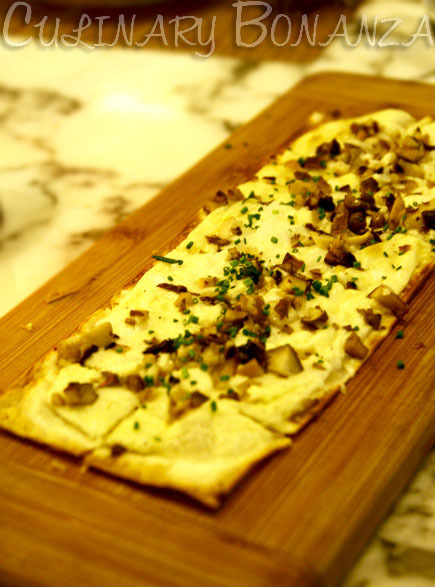 Tarte Gratinée (crispy Alsatian flat bread, fromage blanc, onion & wild mushrooms). Contrary to my initial guess, this is actually not a pizza. It's crispy thin at the edges and the center has fluffy cheese with mushrooms topping. The entire plate was cleared in no time. Chef Istel came out of the kitchen to present us with a very special dish that's not yet included in the menu. 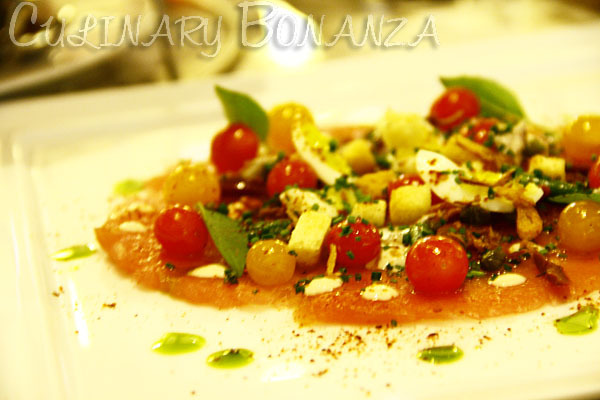 What would be a better surprise than to treat your guests to an earnestly cooked and generous meal? 3 chickens may not have been enough to feed 12 people, but we were spoiled with choices from the the other entrees that already came out earlier. It's a relief to know that dining at a 3 Star Michelin chef restaurant need not burn a hole in your wallet. 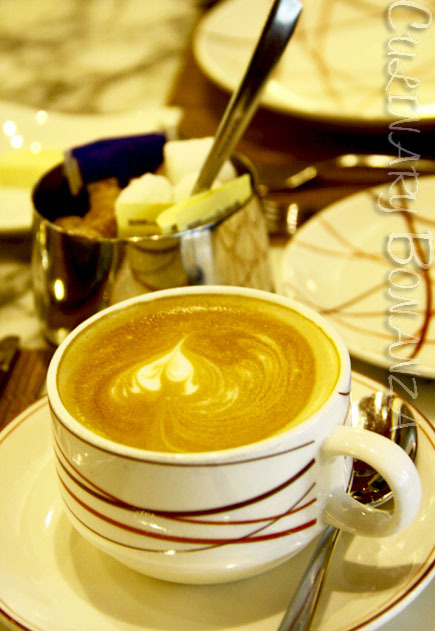 With the quality of food served and the efficient crews, dining here is worth every cent. **) Prices are subject to Sevice Charge and prevailing Government tax.